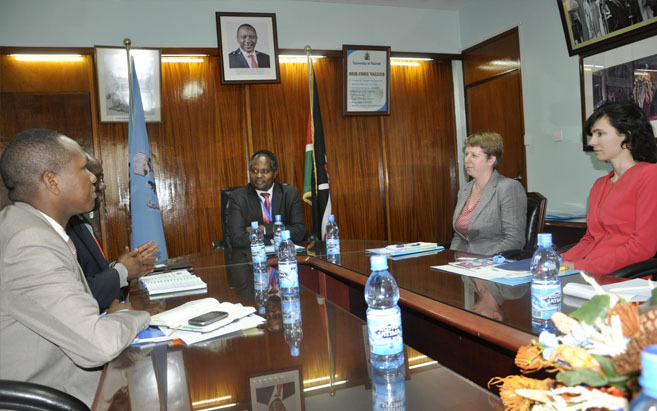 On 11 June 2015, Professor Peter Mbithi, Vice Chancellor of the University of Nairobi, gave his full support to the collaboration between Kenya and Oxford University for the new REACH research programme funded by UK DFID to improve water security for the poor in Africa and South Asia. Professor Dan Olago from the Institute for Climate Change and Adaptation will lead the Kenya country programme with support from Professors Mitullah, Opondo, Dulo, Ouma and Mumma. The Kenya team spans significance experience and expertise in meteorology, hydrology, engineering, development studies, political science, legal studies, water policy, sanitation and water supply. Workshop discussions with Dr Rob Hope, Dr Katrina Charles and Sarah O’Keefe identified the next stages in the diagnostic phase which will be reported at the global conference in Oxford in December 2015. These discussions include meetings with senior Government of Kenya staff from the Ministry of Water, Environment and Natural Resources, the Water Resource Management Authority, and the Water Services Regulatory Board. In addition, the team attended and presented at UNICEF’s East and Southern Africa Regional Office meeting to explore regional collaboration as part of the global partnership with UNICEF.